Grain Bins & Silos | Mixan Mudjacking Inc.
We can handle all sorts of agricultural mudjacking & concrete applications, also repair the tired and cracked base of your grain bins! We do a number of bins & silos. We can usually come in and Mudjack your bin's & silo's without disrupting your operation. Grain bin floors are challenged by the heavy weight of the grain stored inside. They are also less supported as rodents tunnel holes underneath. Help maintain your grain bins by allowing us to fill the voids and help raise and support the concrete slab. This will provide a better storage base for your grain. By filling in any crack or open area under your floors we would be able to return your bin to a safe and functional storage facility. Grain bins are a large investment, so don't jeopardize your bins or silos by overlooking problems that may come up with your foundations, floors or pads. Fixing voids or settling issues when they are first noticed may save thousands in later fixes. Let us be your partner to solve any foundation, floor problems you may encounter on your farm or feedlot. 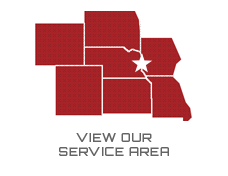 We'll do our best to ensure that your grain bin foundation remains strong and functional. Remember, without a solid base many things can go wrong. Your grain bins are usually floating foundations meaning the foundations don't go below the frost line. So with this said the bins are much more likely to shift and crack over time, so instead of paying thousands to have a new floor installed, with our specialized equipment we can lift your bin back in place or fill a void due to rodents. This will provide a solid base under your bin floor that will support all of your grain. A 9,000 bushel bin weighs over 500,000 lbs plus the bin and floor, so any part of the floor that isn't supported with this much weight you can imagine what damage can be done to a floor or bin. If you are affected by any of these issues, give us a call. We would be happy to provide you with a written proposal for the necessary repairs. The first set of pictures below are feed bins that had settled over 1 years time, due to poor compaction of the soil under the concrete pads. You can see them leaning and putting stress on the tubes that take feed to the hogs. We lifted the bins in the morning and 4 hours later the rancher had the bins filled with feed, we didn't interfere with the hog operation at all which saved the rancher a lot of time and headaches. We do a number of slabs in feed lots. We can usually come in and mudjack your feed bins without disrupting your operation. Grain bin floors are challenged by the heavy weight of the grain stored inside. They are also less supported as mice tunnel holes underneath. Help maintain your grain bins by allowing us to fill the voids and help raise and support the concrete slab. This will provide a better storage base for your grain. 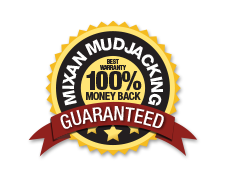 Mudjacking stabilizes the sub-soil, eliminates color differences between old and new concrete and fills the void, eliminating erosion, water penetration, certain foundation leaks, animals, and insects. This Picture shows a badly settled grain bin which had settled 6" and had cracked inside of the bin due to rats tunneling under the floor.We filled voids and lifted the floor back into place stabilizing the concrete, then we caulked all of the cracks.